Home » Village History » Rothley War Memorial » ROSS J.
Royal Engineers-359th Water Boring Company, formerly Leicestershire Regiment. He was listed as Pte. 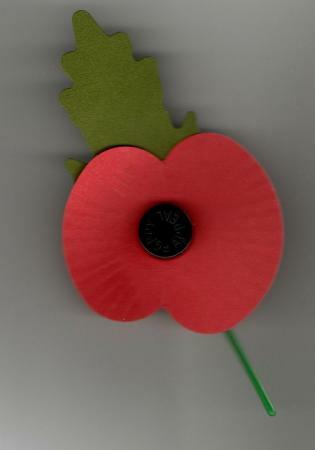 821 in the Rifle Brigade, Pte. 2785 in the Leicestershire Regiment, Pte.204081 in the Rifle Brigade and finally Sapper 566972 Royal Engineers in the 359th Water Boring Company. Died in Egypt on the 6th March 1918 aged 35 years. 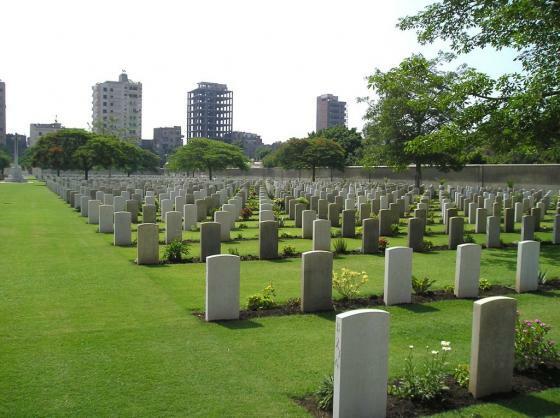 He is buried in the Cairo War Memorial Cemetery, Egypt. His gravestone inscription is "HE STILL LIVES IN THE HEARTS OF THOSE THAT KNEW HIS WORTH"
James Lionel Ross was the son of James and Christina Ross and brother to Frances Grace Ross and Rhoda Adamson Ross. Sapper Ross lived with his wife, Frances and their son Lionel at 19 Chorley Hall Lane, Alderley Edge, Cheshire. 1905. 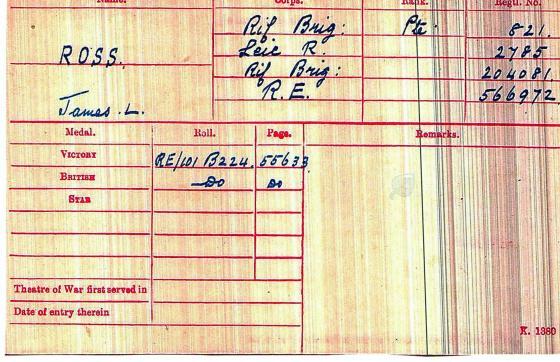 He enlisted in Mountsorrel so finding his connection to Rothley involved a lot of research. In 2014 the breakthrough came when it was found that his Informal Will under the 1837 Wills Act had survived. An Informal Will made it easy for a soldier in the front line to draw up his wishes in the event of his death. Not all such Wills survived the action of war as they were kept by troops in their pocket service books and tucked into their uniforms. However, James Lionel Ross's did and these Wills became available by the owners, Her Majesty's Court and Tribunal Service, on payment of a fee. Here is the Informal Will of Sapper James Lionel Ross where he leaves all his property and effects to Mrs Frances Ross, Woodgate, Rothley, Nr. Leicester. For a short time they lived in Woodgate, Rothley, with their son Lionel but Frances moved back to Alderley Edge after his death where she ran a shop. Lionel, their son, went to live in Canada. With thanks to Margaret Almond (now Siddons) for this information. She was the great niece of James Lionel and Frances Ross with her father, Alfred Almond, being the cousin of James. 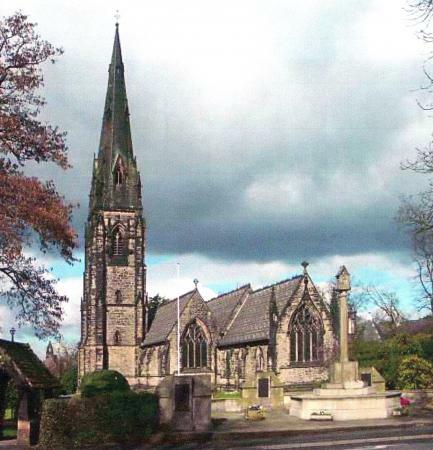 Named on the War Memorial, Parish Church Roll of Honour, Parish Church Triptych Roll of Honour and Alderley Edge War Memorial. War Medal Card showing the changes of regiment. 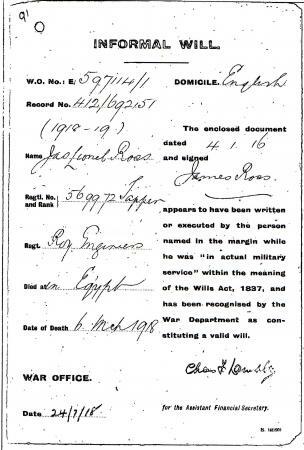 Tracing Sapper James Lionel Ross and finding a link to Rothley proved very difficult until it was discovered that he had left an Informal Will under the 1837 Wills Act. 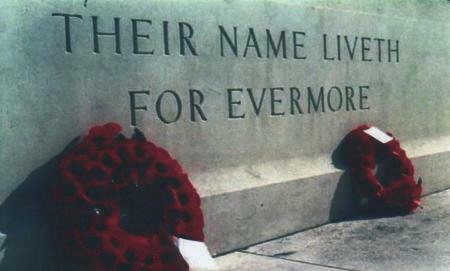 This made it easy for a soldier in the front line to draw up his wishes in the event of his death. Not all such Wills survived the action of war as they were kept by troops in their pocket service books and tucked into their uniforms. However, James Lionel Ross's did and they recently became available by the owners, Her Majesty's Court and Tribunal Service, on payment of a fee. 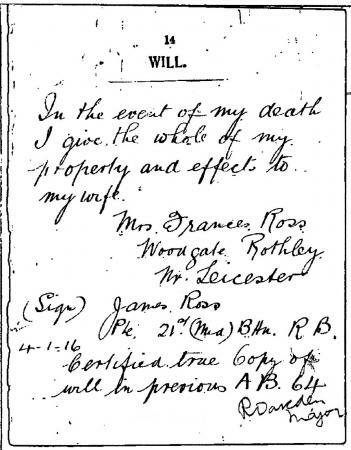 Here is the Informal Will of Sapper James Lionel Ross where he leaves all his property and effects to Mrs Frances Ross, Woodgate, Rothley, Nr. Leicester. Sapper James Lionel Ross is also commemorated on the War Memorial in the churchyard of St. Philip's Church, Alderley Edge, Cheshire.